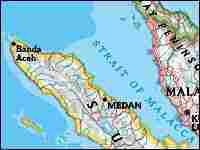 Sumatra's Aceh Province to the north was hard-hit by the Dec. 24, 2004, tsunami that devasated coasts all across the Indian Ocean. Indonesia has had more than its fair share of natural disasters recently. The 2004 tsunami devastated many parts of Aceh, at the northern tip of the Island of Sumatra. It was followed by deadly earthquakes a few months later, and in July yet another tsunami hit the island of Java, killing hundreds more. Conservationists are hoping to sidestep another threat — this time, a threat largely man-made, but no less real. The Leuser Ecosystem, one of the world's richest yet least-known forest systems, is increasingly threatened by logging and encroachment by a burgeoning population. 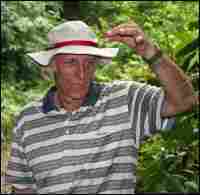 Mike Griffiths, a former oil company executive turned conservationist, heads Leuser International Foundation. He sees the Leuser as his second home, and he's hoping to save the integrity of the incredibly rich ecosystem where great apes coexist with tigers and rhinos. 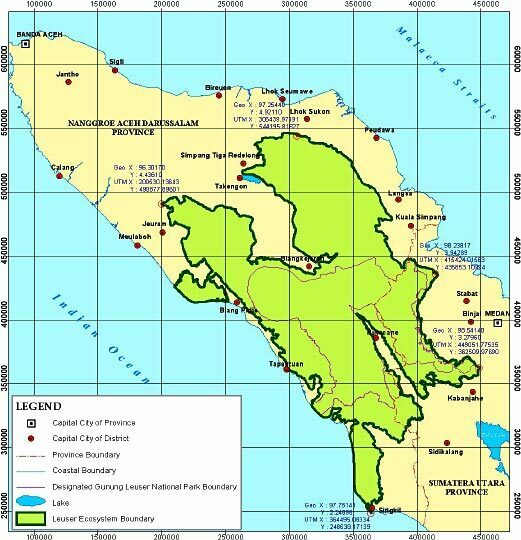 The Leuser Ecosystem sits at the heart of the island of Sumatra, surrounded by rapidly growing population centers. Griffiths was one of the first to take to the air after the 2004 tsunami to capture videos that helped rally global support for aid. That humanitarian disaster, which took the lives of hundreds of thousands on both sides of the Indian Ocean, has a silver lining for conservationists. Many donors, who together pledged more than $5 billion for reconstruction and relief efforts, insisted that some of that money be set aside for preserving the environment. The money helps fund several conservation projects in the Leuser. Griffiths says the conservation efforts are critical for both the wildlife within the Leuser and the humans along its edges. "If you lose the Leuser ecosystem, you don't only lose the last real chance for the tiger, for the orangutan, for the elephant and for the rhino," he says. "You lose the basic foundations for the welfare for four million people — that is how many rely on this place for water, flood protection and erosion protection." Efforts to keep the forest healthy may be complicated, Griffiths says, by a new peace agreement between Acehnese separatists and the Indonesian government that brought an end to decades of bloody conflict. Fear of encountering the enemy kept both sides out of the forest for a decade. With peace, the pressure on the forest is likely to increase, and the biggest threat — even more than logging of valuable tropical hardwoods and oil palm plantations — is roads. Most species, Griffiths says, won't cross a road. Just a few roads are enough to fragment some animal populations, sending them crashing toward extinction. 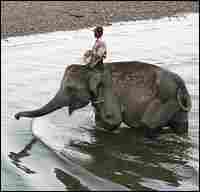 In what Griffiths cheerfully calls a war to save the forest, the Leuser Foundation used some unconventional weapons. Instead of building roads, the foundation built an airport to bring tourists deep into the forest. "Call it a bribe, call it a creative solution — but it worked," he says. "Now they are not doing much illegal logging there, they are not pushing for that road. And Leuser is just a little bit safer, and the people are better off." This two-part series of reports was produced by NPR's Jessica Goldstein. I have been working in Indonesia since about 1980. Since 1985, I have been dedicating just about every day of my life to the conservation of the Leuser Ecosystem, and working with the Leuser International Foundation, which I helped found in 1994 with a group of leading Acehnese who wished to dedicate the remaining years of their life to conservation of this fantastic area. The Leuser Ecosystem is extremely rich. 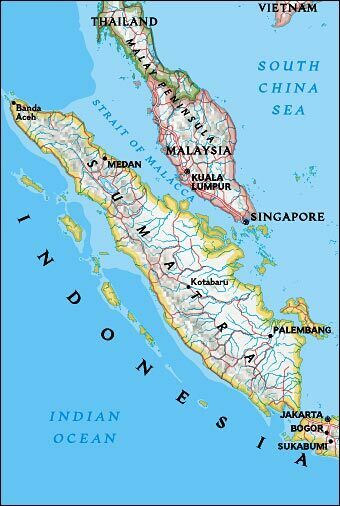 It spreads from the Indian ocean to the Malacca Straits, and crosses two huge mountain ranges in the process (each reaching over 3,000 meters in altitude), a couple of rift valleys, three volcanoes, three peat swamps and about 160 kilometers of beach and coastline. That mix of habitats -- from high alpine meadows right down to deep swamps and rainforest in the lowlands -- make it very special. The Leuser Ecosystem is about 2.6 million hectares in size. It is a mosaic of protected forests, conservation areas and some other areas that haven’t got any conservation status at the moment, and also some recently reactivated logging concessions. It is about three or four times the size of Yellowstone National Park, and that is big enough to include the ranging patterns of all of these large mammals that are so precious. The Leuser Ecosystem is the only place in the world where you have the rhino, elephant, orangutan and tiger all living together in one place. We have no other place in Indonesia where you have sufficient population sizes that they can survive. All of the other populations, I think, have to be managed, because they don’t have sufficient genetic diversity within the populations. If the forest is fragmented, if huge areas are converted to logging concessions or oil palm plantations, then we are going to lose what we have got here. And we will lose it forever. In the 1980s, the Leuser Ecosystem suffered a lot of damage due to logging concessions. Logging concessions -- even sustainable logging concessions, where they talk about "selective" logging -- reduce orangutan numbers by something like 70 percent. For the last 10 years, we have had a conflict in Aceh. During that time, logging concessioners have not been able to operate -- and as a result, many of the forests which were almost doomed at that time have actually recovered. 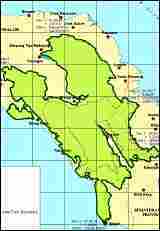 We would like to see most of the core of this area fully conserved, while around the periphery have what you can call "buffer zones" where you can have plantations -- perhaps even logging concessions -- or industrial tree estates and so on. 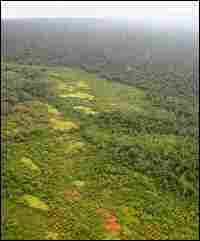 Plantations, if they are in the right area around the periphery of the Leuser Ecosystem, form a green "fence." Biologically speaking, plantations are very poor. They don’t have much biodiversity. But they do form a barrier for people moving in, and they protect people on the farms from the animals moving out [of the Leuser Ecosystem]. Elephants can be very disruptive -- so can pigs. Tigers sometimes eat people. All of these interactions can be reduced if you have buffer zones. 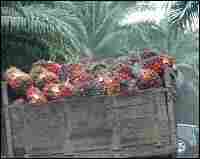 And the best of all, in our opinion, is oil palms [and] oil palm estates. But if those oil palm estates are inside areas which have great importance for the conservation of biological diversity -- such as wildlife corridors, breeding areas, salt licks and so on -- then we have a problem with that. Most of these rain forest animals and species like to be in the shade, and they like to be amongst trees. They don’t like to be out in the open. If they do expose themselves in the open they are subjected to predation. Most of them won’t touch an open space. Even when you have a big tree fall in the forest they will prefer to walk around or fly around or circumvent that open area rather than fly or crawl across it. Roads are huge and very long barriers. If you think about the after-effects of roads -- people are encouraged to come in and take out the trees, they will try and come in and encroach, perhaps they will be speculating on land sales on one side of the road -- then you have complicated and long-lasting problems. If you lose the Leuser Ecosystem, you don’t only lose the last real chance for the tiger, for the orangutan, for the elephant, for the rhino and many other species as well. You lose the basic foundations for the welfare for four million people -- that is how many rely on this place for water, flood protection, erosion protection and so on. There are hundreds of ways that I think we can measure and view the services that the Leuser Ecosystem provides, but it is important to think of this forest as a whole. Every animal, every bird, every insect, every plant plays a role in the preservation of biological diversity. Orangutans are very important for seed dispersal. They eat lots and lots of fruits, and some are only obtainable by primates of that kind of nature, and this maintains biological diversity. It also helps with forest restoration. We have major tree falls, and it is these animals coming back and dropping seeds into newly cleared areas that allow the forest to grow and rehabilitate itself. All of these animals are part of the cycle. In order to win and protect these forests, you have to know when to compromise. You have to know when to be diplomatic. You have to know when to unleash the so-called "wild cards" of the conservation game. There are many times when you would love to get very angry when you see another 10 hectares of forest leveled, but you have to control yourself. The war is not won in these forests. The war is won in the concrete corridors of the capital cities. It is won really with the will of the donor community, it is won in the Parliament of the central level of this country, and the provincial and the local levels. These people make the laws -- if they make the wrong laws, we will lose the Leuser.